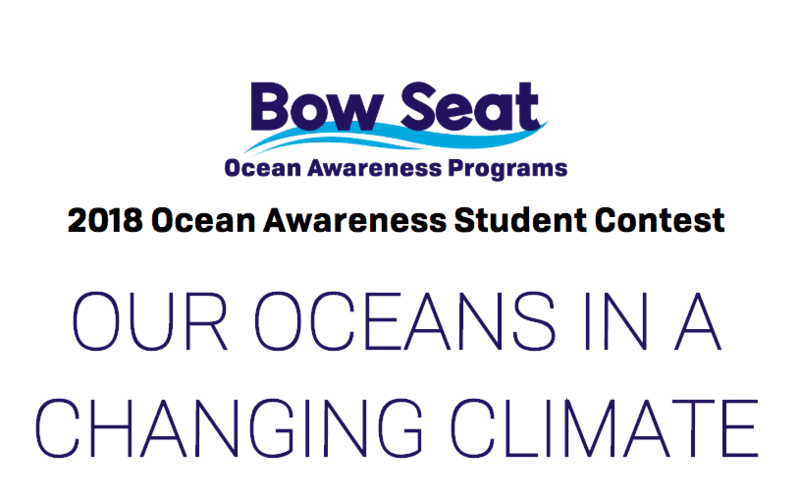 Home Contests Bow Seat 2018 Ocean Awareness Student Contest for students worldwide. The Ocean Awareness Student Contest is open to students aged 11-18 worldwide. Your work should explore the relationship between human systems, climate change, and our oceans. We challenge you to create a piece that not only presents issues and challenges, but also communicates a message that inspires others to act. We encourage you to connect your submission to your own life, your local community, or something else that motivates you. How do human systems affect the ocean? How do oceans affect life on land? How are ocean health and human health connected? What responsibilities do humans have to the natural world and its inhabitants? What will the planet look like in 2100 if we continue with “business as usual”? How do oceans play a role in mitigating climate change? How large is your carbon footprint? How do you play a role in causing – and preventing – the impact of climate change on our oceans? Will climate change affect everyone equally? How will your community have to adapt? How does mass media play a role in shaping the stories we hear about climate change? What innovative solutions have been created or proposed to address the impacts of climate change on our oceans? What challenges do these solutions face to widespread implementation? How should scientists, designers, and policy-makers work together to address climate change issues? How can we communicate stories about our oceans and climate change that make an impact on others and compel them to act? What strategies do artists use to help us understand the impacts of climate change as well as to move us to feel something about it? This is an international Contest and is open to students in middle school or high school worldwide. Students age 11-14 (before the deadline June 18, 2018) may enter the Junior Division. Students age 15-18 (before the deadline June 18, 2018) may enter the Senior Division. Participants under the age of 13 must have a parent or legal guardian complete a Children’s Online Privacy Protection Act (COPPA) Parent/Guardian Consent Form and upload it as part of their submission. Entries may be submitted by an individual or group of unlimited size. If you submit as a group, there must be one group leader who will serve as the contact person for the group. All of the names of the group members must be listed in the submission. Award money will be split among the group members. Any student may submit (i.e., have their name included in) only one entry per category. Therefore, a student may have a maximum of five different submissions, one in each category. Over the course of the Contest, other awards may become available and will be listed here. The winners of these awards will be chosen and announced at the same time as the category awards.